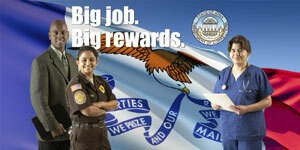 Explore a Career in Corrections! Corrections plays a key role in the criminal justice process in Iowa. Correction's staff work to create safe communities through using evidence-based practices and progressive approach to correctional supervision. Both prisons and community based corrections ensure that offenders are supervised appropriately and receive programming necessary to reduce the likelihood of reoffending. There are several career choices in corrections. Download our Employment Brochure here. Specifically at Iowa State Penitentiary you can find several challenging and rewarding positions that will allow you to positively impact someone’s life. Directly supervises offenders as well as their day to day activities, such as housing, showers, food and recreational activities. Requires excellent communication skills and a professional attitude. This position directs offenders movement and assists with running the institutional schedule. Requires organizational skills and ability to multi-task in stressful situations. As a front line supervisor this position supervises officers and sergeants' performing daily duties as well as other administrative functions. Leadership and communication skills are a must for this post ion. Counselors play a vital role in the classification and reentry process as well as assisting offenders with navigating the various rules and policies that govern activities. Food service staff supervise offenders who are assigned to work in the kitchen. Staff ensure that all food preparation adheres to safety and sanitation regulations to produce quality meals for offenders and staff..
Staff who work in the medical field for the Department of Corrections include Nurses, Doctors -(Physician, Dentist and Optometrist) , dental hygienist, LPN's and X-ray technicians. These medical professionals work closely with security staff to meet the medical needs of the offender population. Psychologist staff work one on one with offenders that have been identified or self-identified as having a need of such services. Activity staff schedule and coordinate recreational programs to keep the offender population active and productive. This position requires a positive attitude and the ability to work well with others. Correctional Trades Leaders have many different skill sets, plumbers, electricians as well as general construction. The staff in this department are very diverse and are able to respond and address a wide variety of issues that may arise in the facility. Clerk Specialists, Administrative Assistants and Secretaries are just a few of the types of administrative staff that perform a wide variety of functions daily. Hiring is not always constant, so if you are interested in a position you should check frequently with Iowa Department of Administrative Services web site. All open positions for the State of Iowa are posted here.. Some position require testing and appropriate certifications to apply.